Our 4.5m wide model left out in the cold. 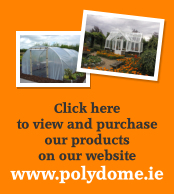 Polytunnels like other greenhouses provides protection for crops over the colder winter months. The biggest threat to plants during this colder period is frost. Frost causes the water in plant cells to freeze. The result of this is damage to the cell wall which leads to wilted growth causing the plant to become blackened and distorted. Under sever frost the temperature will drop to a point where only supplementary heating inside the tunnel will protect against the cold. 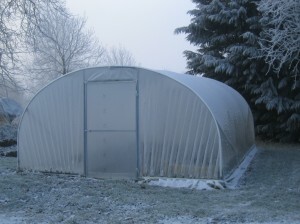 But before reaching this point, there are some steps that maximise your tunnels ability to protect against the frost. Make sure your tunnel is located in the sunniest location of the garden. 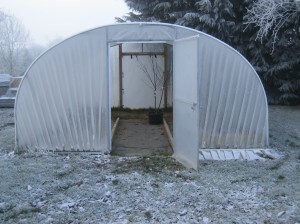 This allows your tunnel to heat up during the day in the low winter sun. Clean your tunnel cover annually. This will reduced any obstructions to the sunlight passing through the polythene which will also help heat the tunnel. Finally make sure when purchasing your tunnel than you only use a thermic plastic, which has good thermal properties. This will help reduce heat loss through the cover thus giving better protection to your crops during winter. Thankfully its nicer inside than outside the tunnel.